Turn any day into a picnic with this gourmet Picnic Fruit Basket! Perfect as a gift basket for families, men, women, birthdays, holidays, thank you, sympathy, and corporate, this healthy food gift artfully combines orchard fresh fruits with gourmet snacks! Includes juicy oranges and apples, farmhouse Cabot cheddar cheese, summer sausage, salt & pepper water crackers, pretzel twists, raspberry honey mustard pretzel dip, and hard fruit candies! Exclusively from GourmetGiftBaskets.com! Turn any day into a picnic with this gourmet Picnic Fruit Basket! Perfect as a gift basket for families, men, women, birthdays, holidays, thank you, sympathy, and corporate, this healthy food gift artfully combines orchard fresh fruits with gourmet snacks! Exclusively from GourmetGiftBaskets.com! 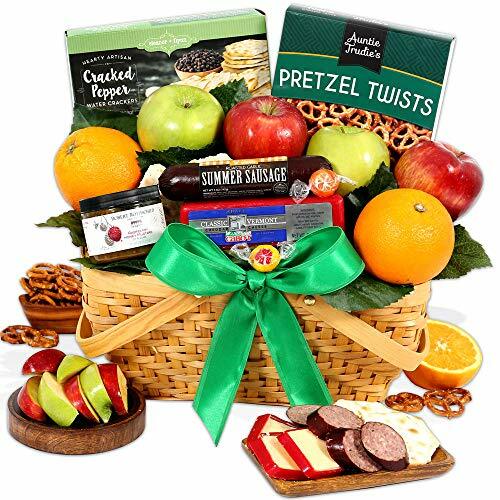 Includes juicy oranges and apples, farmhouse Cabot cheddar cheese, summer sausage, salt & pepper water crackers, pretzel twists, raspberry honey mustard pretzel dip, and hard fruit candies! Keepsake handled basket with fresh fruit and gourmet foods is professionally shrink wrapped with festive ribbon.